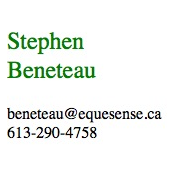 Stephen Beneteau has a Bachelor of Arts degree from the University of Windsor supplemented by a Diploma in Computer Programming from Algonquin College. Since 1992 he has been learning and applying better processes for software development. 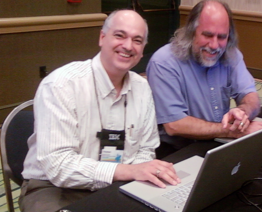 As a Staff Software Developer for IBM Rational from April 2000 till May 2005, Stephen worked with engineers from other companies such as NASA, Lockheed Martin, and Xerox to develop strategies for model organization and team development. Previously, Stephen worked with DMR as a senior systems analyst. Since leaving IBM, he has been helping Equesense clients on medium and large projects as a Software Architect and Process Engineer. A byproduct of his work as an Architect on large projects has been the development of UNIVOLV, a consumption based process engineering tool to help teams realize the most benefit from process improvement initiatives. © 2012 &dash; Equesense Consulting, Inc.